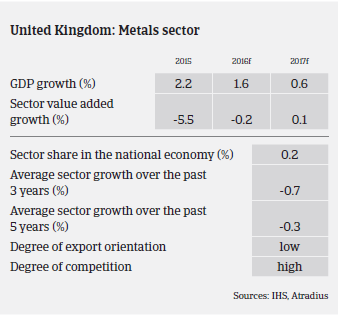 The market situation of the British steel and metals industry remains difficult, as overcapacity, fierce competition, exchange rate volatility, high energy costs, on-going austerity measures and increased uncertainty due to the Brexit decision continue to weigh on the performance and financial strength of many businesses. Like their European peers, British steel producers suffer from the increased levels of steel shipments originating from Russia and China, while steel prices remain depressed, largely as a result of low commodity prices and in particular iron ore. Both countries, in particular Russia, have always been near the bottom end of the cost curve providing them with a competitive advantage. Additionally British steel and metals businesses were affected by on-going difficulties in the construction sector, which is a main consumer of steel. While the residential building sector has reported growth, this segment requires very little steel and metal. It is expected that the UK construction sector will be negatively affected by the recent Brexit decision, as the subsequent economic uncertainty has started to trigger the postponement of investment decisions. The more adverse market conditions have continued to impair revenues, margins, profits and cash flow for many businesses. Consequently, in a bid to mitigate liquidity risks, cost cutting programmes and vigilant cost management strategies have been implemented, inventories are being unwound and non-core assets disposed of. However, while cost containment measures have been the industry´s main response to overcapacity so far, this could turn out to be just a short-term remedy. Maintaining margins through cost reduction and focusing on high-end products should not be seen as an ultimate solution to structural problems. That said, many businesses have already invested in new technologies, such as laser cutting and detailed integrity scanners in order to gain competitive advantages. In the steel and metals industry the ability of businesses to process products efficiently is a major asset. 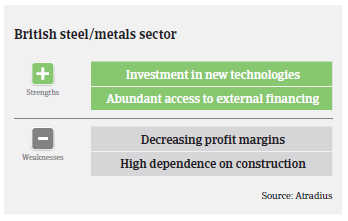 Although low margin businesses, UK steel stockholders are mainly long established and profitable. They are heavily reliant on bank finance (mainly invoice discounting) in order to have stock available as and when it is required. Usually they have low overheads, which makes them resilient to economic changes, as they are able to unwind inventories in order to free up cash. Low steel prices also provide them with opportunities to purchase products cheaply. The average payment duration in the UK steel and metals industry is 60 days. Despite the current challenges, payment delays are not expected to increase for the time being. Insolvencies are not expected to show a major increase in 2016, however, caution is advised due to the still fragile nature of the sector, which can lead to unexpected failures. Our underwriting approach remains selective, as market conditions are unstable and the potential volatility of a rebound should not be underestimated. However, we continue to underwrite positively on acceptable risks. 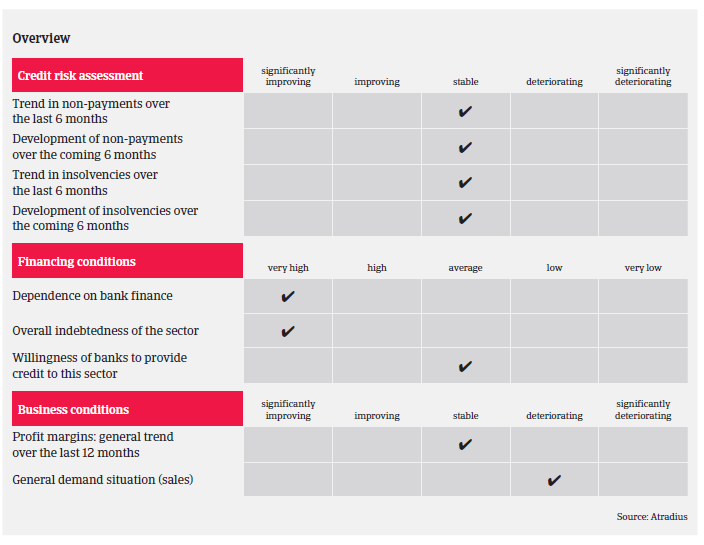 While our underwriting strategy is largely on a case-by-case basis, over the last few years, we have adopted a comprehensive understanding of the sector and the prevailing issues. We are mindful that this is a low margin sector, with fierce competition and high dependency on banking lines, where highly leveraged balance sheets can cause issues during a downturn.